I'm pleased to officially announce the upcoming publication of my first book! THE IMPROV HANDBOOK FOR MODERN QUILTERS: A Practical Guide for Creating, Quilting, and Living Courageously by Sherri Lynn Wood is a comprehensive guide on the process of improvisational patchwork quilting, which includes 10 project scores, innovative sewing techniques, tips for accessing intuitive color, and mind tools for creating with fearless spontaneity. Scheduled to be published by Abrams Books under the imprint of STC Craft / A Melanie Falick Book in Spring 2015. I began working with a literary agent in November 2013 on a detailed book proposal. In March 2013 we submitted the 50 page proposal to a handful of publishers. I was thrilled to have phone interviews with a majority of the editors representing the publishing houses and received several offers. The most exciting part of this process was hearing how each editor would emphasize different aspects of my proposal to fit the publisher's mission of reaching it's particular audience. Once the offers came in it was really a tough decision to choose one, but ultimately I decided to work with Melanie Falick at STC Craft. She designs some of the most beautiful craft and lifestyle books on the market today. Melanie edited my friend Sabrina Gschwandtner's book KnitKnit, and Denyse Schmidt's latest book Modern Quilts, Traditional Inspiration. In the next couple of years I know that STC Craft will be publishing books with Spoonflower, Kristine Vejar at A Verb For Keeping Warm, and Heather Jones. STC Craft creates books that highlight the unique visions of their authors. Improvisation is a fundamental process at the heart of every great creative endeavor. Music, dance, theater, painting, drawing, design, cooking, conversation, relationships, play, life and even the discipline of science benefits, survives, grows, transforms and innovates through the flexibility of mind that improvisational process engenders. The Improv Handbook For Modern Quilters provides a comprehensive framework for fostering improvisational skills through the discipline of patchwork quilting. The 10 patchwork projects featured in the book are organized as “scores” or “games” rather than as patterns. A score or lead sheet, common to improvised musical traditions such as jazz, is a set of notations or parameters within which the improvisation is free to take shape. In the discipline of improv theater a game defines the set of limits in which an improvised and unscripted scene unfolds. Each quilt score is designed holistically to illustrate a) approaches and methods from different improvisational disciplines, b) innovative sewing techniques particular to improvisational patchwork, c) design considerations and exercises, and d) mind tools for fostering fearlessness, presence and curiosity. 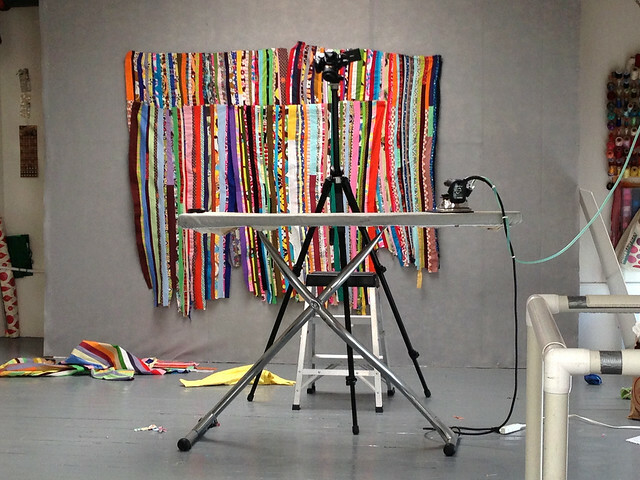 For instance one project asks the reader to think about doodling as a method for improvisation, by introducing the techniques for building a quilt with simple shapes, while also encouraging a mindset of acceptance. Another project will get you thinking about the design element of rhythm by posing a puzzle to be solved, while teaching skills for ruler free measurement. My goal for the Improv Handbook is to teach improvisational patchwork in a way that encourages authentic expression. To this end, along with my interpretation of each score, the book will feature one or two quilts by other people to illustrate the infinite range of possible outcomes that improvising from a score allows. As an example the Mod Mood Quilt is written as a score to interpret, rather than being presented as a pattern to follow, and you can see a range of interpretations of the Mod Mood Quilt score here. 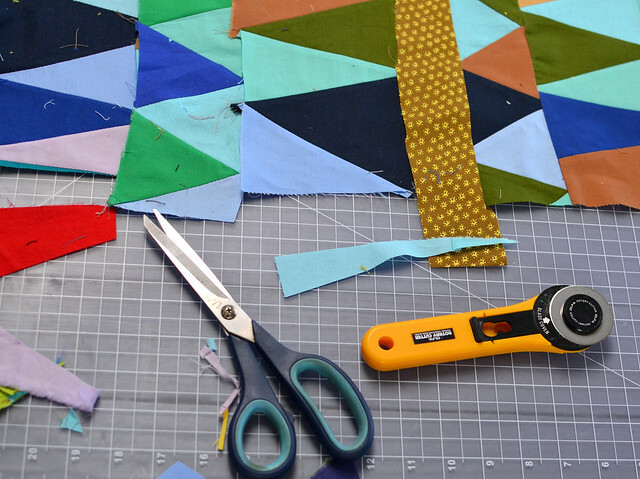 January 1 - Register to participate as a test-quilter. February 1 - Open registration to participate closes. Scores sent out to test-quilters. 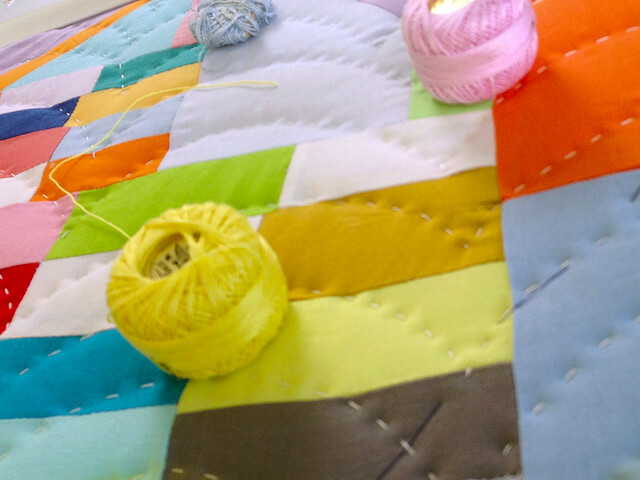 March 1 - Information about contributor quilt submission process will be sent to test-quilters. March 25 - Images of finished quilts based on the scores provided are due and will be considered for publication in the book. Submitted quilts will be reviewed and chosen for publication by me and the editorial staff based on how well they illustrate an alternative yet recognizable interpretations of the quilt score provided. April 1 - Makers of the chosen entries for the book will be notified. April 15 - Chosen quilts will need to be quilted, bound, shipped to and received in Oakland by this date, for photography. The publisher will pay for round-trip shipping by USPS Priority Mail to Oakland, CA. Makers of the chosen entries will be completely acknowledged in print, and will receive a complementary copy of the book. The makers of non-chosen quilts will be entered in a drawing for complementary copies of the book and other thank-you prizes hand-made by me. 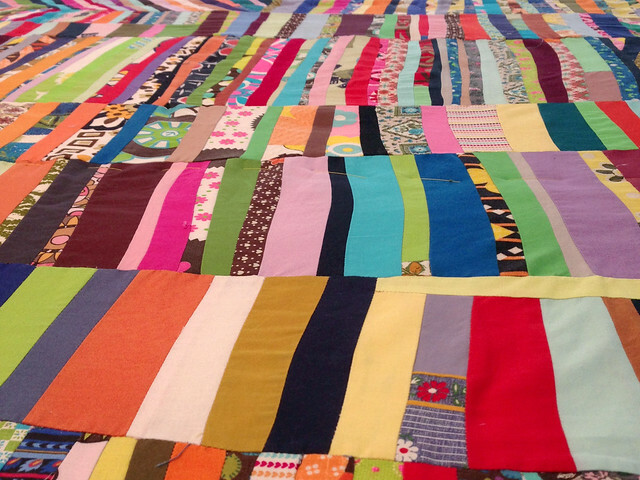 There will be an online forum showcasing ALL of the test quilts with the release of the book in Spring 2015. There may be exhibition opportunities for the test quilts, but there is nothing on the calendar at this time.